A healthy food, a proper shelter and a regular grooming regime is all what culminates to keep your pet fit and happy. But, at times you may face certain conditions in your pet that just leave you down. Pounding on those grey cells about what must have been gone wrong after seeing certain changes in your pet, you may be worried much deeper. The most common symptoms of food allergy are skin rashes, inflammation, itching, hives, paw biting, obsessive licking and sometimes nausea or vomiting. Which food causes allergy in my doggy? Are dogs allergic to peanuts? Normally, peanuts or peanut products are safe for dogs. But, as humans, some dogs may experience allergic reaction to peanuts. So for such dogs, eating peanuts may be dangerous. If my dog develops an allergy to specific food, does that mean there is something wrong with the quality of the food? The fact is allergies are not related to particular brand product but rather it is something to do with your pet’s immune system. Therefore, if a dog is allergic to a particular proposition, he will likely to develop the negative reaction with the same ingredient despite its presence in any brand food. When my dog shows any kind of allergy, do I immediately conclude that it’s due to food that I gave? Not always. Food is not only the factor behind allergy in dogs. There are other aspects also that play a role in causing allergies in dogs. Moreover, there are different kinds of allergies depending on various attributes. Food is only the third in the list of the causes of canine allergies, the signs and symptoms you see may not be even related to your dog’s diet in the first place. Is food allergy and food intolerance same? No, they both are two different entities. Food intolerance is digestive problem rather than immune problem. Intolerance occurs when a dog’s digestive system is unable to digest a specific ingredient. How can we know food intolerance in dogs? From certain signs and symptoms, you can find out about food intolerance. The most common signs are gas, bloating, nausea, digestive distress, vomiting and diarrhea. Other than food ingredient, what else can be the cause of food allergy in my dog? Several times, it is not just the ingredients themselves that pose problem to your dog. 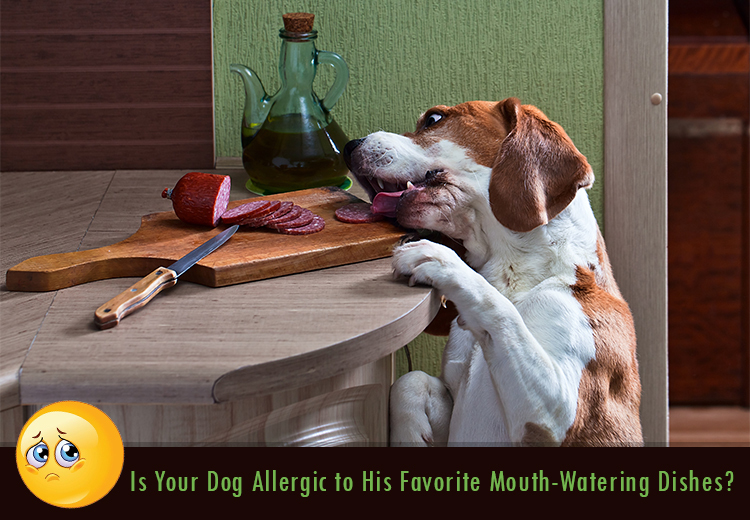 In some cases, a dog can be allergic to pollutants in the food itself. In case, I suspect the allergies are caused due to his food, what should I feed my dog? Since, certain recipes are specially designed to support you control or detach these problems. You can feed them with these hypoallergic food products. What should I do if I find my dog may be suffering from allergies? Canine allergies can have serious impact on your pooch. Therefore, when not knowing what to do or rather than depending on granny’s old remedies, consult your vet. « Unveil the Steps to Train Your Dog Greet Visitors Politely?